A beautiful early antique draughtsmans chair in solid oak by Glenister of High Wycomb. 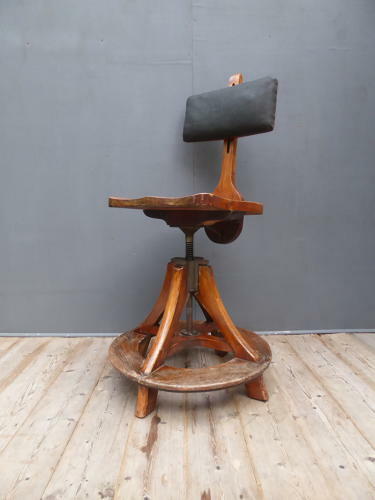 A stunning piece of early industrial design featuring an adjustable back-rest, single plank seat & height adjustable swivel mechasnism. The chair retains its original oil cloth upholstery, cast iron fittings & large circular footrest and is stamped with its makers mark on the lower part of the back. A wonderful example. Late 129th / early 20th century. Wear commensurate with age, clean & ready to use. Unrestored. UK courier service available at £28 tracked & signed for 24 hour delivery.